A harvest of fresh garden vegetables such as baby carrots, celery, cucumbers, yellow squash...etc. 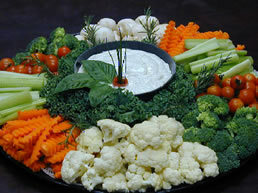 with our dip style ranch dressing or cream cheese spread style such as bleu cheese & chives or garlic & chives. A great compliment to our other platters. A combination of market fresh vegetables such as baby carrots, celery sticks, cucumber slices, yellow squash, etc., in combination with dill pickle spears, greek olives, green olives, pepperoncinis, etc. Served with your choice of ranch or bleu cheese dip style or cream cheese spread style such as garlic & chives or bleu cheese & chives. A traditional mediterranean and middle eastern delicacy plate, served in most occasions to get your appetite going. A combination of feta cheese cubes, plum tomatoes, cucumber slices, greek kalamata olives, red onions, peperoncinis, pickles and fresh mint basil leaves. Served with hummas and pita bread. Our own recipe of italian salsa made with chopped tomatoes, fresh basil, black olives, fresh garlic, olive oil, crumbled bleu cheese and balsamic vinegar. Served with assorted gourmet crackers, focaccia bread, mini bagels, sourdough baguettes or parmesan bagel chips. Our famous garlic parmesan bagel chips with our own dips, such as roasted red pepper hummas, garlic & chives hummas, blue cheese & chives spread or garlic & chives spreads. Great for snacking or adding to your hors d’oeuvres. A mountain of whipped cream cheese torte made with sundried tomatoes and basil pesto with toasted pine nuts, served in the center of assorted gourmet crackers, foccacia bread, mini bagels or seedy baguettes. An excellent hors d’oeuvres. Assorted cheeses in cubes such as cheddar, colby jack, imported swiss, provolone and jalapeno jack teamed with fruits of the season such as sweet red & green grapes and strawberries served with assorted gourmet crackers. A selection of assorted Italian meats and cheeses composed of mortedella, cotto salami, capicollo and italian salami with provolone, swiss and mozzarella cheese, garnished with olives, pepperoncinis and pickles. A savory combination of italian salami and assorted cheeses in cubes such as cojack, sonoma jack, swiss, cheddar and jalapeño jack cheese. All around a center of a cream cheese tort. Served with assorted gourmet crackers. Just the way your mom makes them to nibble on. 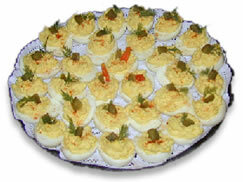 Our own house deviled eggs made with honey mustard, fresh dill and capers. Garnished with parsley, greek olives and cherry tomatoes. Great to get your appetite going. A variety of mini quiches and filo dough puff pastry filled with spinach and cheese. A delicious appetizer to compliment your finger food. Half Avocados stuffed with our famous tuna salad or seafood & crab salad beautifully arranged on a tray and garnished with greek olives, fresh dill and carrot shavings. A great appetizer or a meal! Shrimp lovers, feast your eyes on the fruit of the sea and enjoy this cocktail jumbo shrimp platter and dip them in a pool of cocktail sauce. Chicken wings, chicken drummettes or chicken tenders along with creamy ranch dressing or bleu cheese dressing for deli dipping. Pillars of chicken egg rolls, served with sweet spicy honey mustard or our famous oriental peanut sauce. Don’t forget the kids. A platter loaded with peanut butter & jelly and /or cheese finger sandwiches, just the way kids like it decorated with Hershey Kisses. Your choice of our homemade potato salad, macaroni salad or cole slaw. Perfect for accompanying our other platters. Our famous tri color cheese filled tortillini pasta with roasted veggies, peppers, eggplant, and zucchini, along with kalamata olives, pinenuts and feta cheese, all in sundried tomato and pesto dressing. It’s a meal, it’s a must. Spinach rotini pasta with artichoke hearts, carrots, olives & bell pepper in balsamic olive oil vinaigrette, and feta cheese. Market fresh greens and vegetables with our original dressings. Gourmet fits the description. A great compliment to the other platters. Crisp heart of romaine lettuce, roma tomatoes, croutons and parmesan cheese with our famous basil caesar dressing. Our famous caesar salad with our own italian marinated chicken breast. Crisp romaine lettuce, napa cabbage, crunchy chinese noodles, bean sprouts, toasted peanuts and mandarin oranges, served with sesame ginger vinaigrette. Romaine lettuce, roma tomatoes, kalamata olives, feta cheese, cucumbers, purple onions and sundried cranberries, served with our balsamic olive oil vinaigrette. Our famous greek salad with marinated chicken breast. Fresh spinach, roasted peppers, zucchini & eggplant, greek olives, roma tomatoes, feta cheese with our balsamic olive oil vinaigrette. An array of exotic greens & romaine lettuce, roma tomato, capers, pine nuts and fresh dill with strips of pacific northwestern smoked salmon and goat cheese. Served with our own olive oil balsamic vinaigrette. Crisp romaine lettuce & exotic greens, BBQ chicken, avocado, roma tomatoes, roasted red peppers and jalapeño jack cheese, served with our own creamy BBQ 1000 island dressing. An array of exotic greens, goat cheese, raisins, sundried cranberries, plump roma tomatoes, cucumbers, red onions, roasted pine nuts & pecans, served with your choice of italian, ranch, 1000 island, bleu cheese, basil caesar or balsamic olive oil vinaigrette. Crisp romaine and iceberg lettuce, roma tomatoes, cucumber slices, purple onions, carrots and roasted pine nuts. Served with your choice of dressing. "See regular menu for more choices." Wake up and smell the Bagels! This platter is perfect to take to the office. A dozen of assorted freshly baked bagels beautifully arranged on a platter around a center of butter cubes and assorted preserves. A dozen & a half of an assorted freshly baked bagels arranged around the center of three spreads of your choice such as whipped cream cheese or the sweet pecan raisin spread, wildberry spread, or others such as garden vegetable or lox & chives spread. This is a must in every breakfast meeting. An assortment of danishes and muffins to satisfy your morning sweet tooth and compliment other breakfast platters. For your early office meetings or weekend brunch, you can have it all. Assorted bagels with cream cheese, danishes, muffins and croissants. 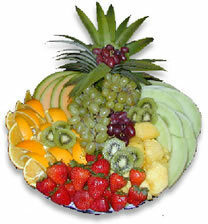 Served with a fruit platter of assorted seasonal melons, grapes and strawberries. And for a small additional charge, don’t forget the freshly brewed Seattle’s Best Coffee and fresh orange juice. A great way to start the day. Egg & cheese omelettes, plain or with ham and bacon served on a variety of bagels or croissants cut in halves and beautifully arranged on a platter, around a center of fresh fruits such as grapes or strawberries. Breakfast burritos filled with scrambled eggs, cheese, ham, bacon and fresh salsa in a variety of spinach and sundried tomato tortillas, served around a center of fresh fruits such as grapes or strawberries. Delicate flaky croissants with honey baked ham and mozzarella cheese around the center of fruits of the season such as red and green grapes or strawberries. A good lite breakfast. Assorted bagels topped with sliced smoked Salmon, whipped cream cheese, tomatoes, purple onions, boston lettuce, fresh dill and capers. Great for breakfast, lunch, brunch or as an hors d’oeuvres on mini bagels. Start spreading the news! This platter has it all, lox with red onions, dill & chives spread, homemade tuna salad, and egg salad arranged on a platter with fresh vegetables such as red onions, tomatoes and sliced cucumbers. Served with a variety of freshly baked bagels. Pacific northwest salmon beautifully arranged with whipped cream cheese, sliced cucumbers, red onions and tomatoes, garnished with fresh dill and capers. Served with a variety of freshly baked bagels. Its’s breakfast! It’s brunch! It’s lunch! It’s a feast. A variety of the highest quality meats and cheeses. An array of tender roast beef, lean imported honey ham, moist turkey breast, honey-smoked turkey breast and italian salami, plus a variety of cheeses such as cheddar, jack, swiss, provolone, american and jalapeño jack cheese. This feast is served with your choice of potato salad or macaroni salad and a variety of breads, rolls or bagels and all the condiments and fixings. It’s perfect and complete for all occasions. A tasty array of meats and cheeses including rare tender roasted beef, imported honey baked ham, moist turkey breast, swiss, american, cheddar and jalapeño jack cheese. Our famous tri color cheese filled tortillini pasta with roasted veggies, peppers, eggplant, and zucchini, along with kalamata olives, pinenuts and feta cheese, all in sundried tomato and pesto dressing. It’s a meal, it’s a must to compliment other platters. A lovely assortment of freshly made finger sandwiches on wheat & sourdough rolls, with your choice of moist turkey, honey ham, roast beef, tuna salad, chicken salad or egg salad, with lettuce, tomatoes and red onions. Delicate flaky croissants with a combination of turkey, honey ham, american and swiss cheese, with lettuce, tomatoes and onions. Great for lunch meetings. 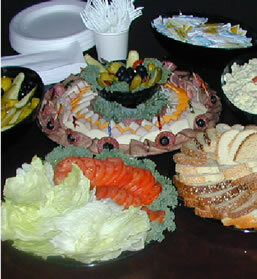 Finger sandwiches of succulent turkey breast and honey ham in combination with swiss and cheddar cheeses on an assortment of breads such as whole wheat, rye, and sourdough, with lettuce, tomatoes and onions. Perfect for office parties or short notice get togethers of any kind. An array of bagel sandwiches cut in halves with moist turkey, imported honey ham, rare roast beef or tuna salad in combination with mozzarella and swiss cheese, lettuce, tomatoes and onions. Choose any kind of bagel you like from onion, sesame, plain, spinach, sundried tomato and many more. Perfect for a lite luncheon. The best of the best. Our fabulous panini sandwiches, prepared with different types of gourmet spreads such as sundried tomato & pesto, garlic & chives, bleu cheese & chives, or cranberry pecan spreads in perfect harmony with moist turkey breast, smoked honey turkey, rare roast beef, and marinated chicken breast on our own homemade focaccia bread. Wrap it up! Our own famous wraps in spinach and sundried tomato tortillas. Choose form a wide variety from our menu such as thai wraps in peanut sauce, greek chicken with roasted vegetables and feta cheese or chicken caesar with parmesan cheese and pesto dressing. Served with potato chips. Pinwheels? Hi Rollers? Lavash? Any way you call it we make it the best. Our own gourmet cream cheeses and spreads such as garlic & chives, bleu cheese & chives, sundried tomato with pesto, and cranberry pecan spread layered on tortilla wraps such as wheat, spinach and sundried tomato tortillas with a variety of meats & cheese, avocado, boston lettuce, tomatoes, red onions and fresh spinach. Perfect for occasions such as birthdays or if you just want to feed a hungry crowd. Freshly baked bread loaded with a variety of meats and cheeses. Our italian style with salami, mortedella and provolone cheese or american style with turkey, honey ham and a cheddar cheese. Our focaccia style is made with our gourmet spreads and meats. Or you can have it the way you like it. This bountiful array of seasonal fruits such as sweet red and green grapes, strawberries, melons, pineapples and kiwi, is the perfect centerpiece of any of our other platters, morning, day or evening. A fruit cocktail loaded with peaches, pears, grapes, pineapples, cherries, and marshmallows in sour cream dressing, topped with toasted pecans. A selection of dried fruits such as mission figs, dates, apricots, cranberries and assorted nuts such as pistachios, mixed nuts, jordan almonds and pastel mints. Great to snack on anytime. A mouth watering selection of fruit bars, baklava, rughulla, lemon bars and pecan bars, garnished with fruits of the season such as sweet red and green grapes or strawberries. It's a must to end your day. A selection of freshly baked cookies to add a nice touch to your meal. Just relax and have a home made fresh chocolate chip pecan cookie, a biscotti or a chocolate wafer with your coffee. Our famous white chocolate raspberry cheesecake topped with fresh raspberries and toasted almond shavings and surrounded by seasonal fruits such as sweet red and green grapes or strawberries. Your choice of any of our deli sandwiches with mayo, mustard, lettuce, tomato & onions, potato salad, Knott's Berry Farm cookies and a beverage such as Snapple, bottled water or soft drink. Choose from tender turkey breast, lean roast beef, honey baked ham, tuna salad or vegetarian on your choice of fresh baked deli sourdough, rye, wheat, onion roll, squaw or french roll. Choose from fresh turkey breast, roast beef, honey ham, tuna or vegetarian on your choice of the many freshly baked bagels. This boxed lunch is served with potato chips, Knott's Berry Farm cookies and a beverage such as Snapple, bottled water or a soft drink. Guess what? Besides bagels we have more! 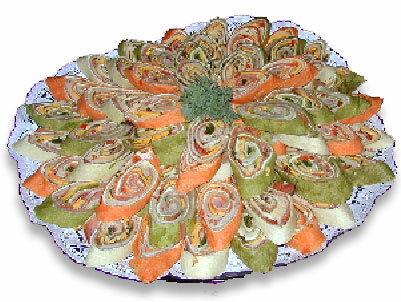 At Golden Bagel Cafe, we offer you other products that you may need for your next party. Quality meats & cheeses and a variety of cream cheeses are sold by the pound at very reasonable prices. And when you order ahead we offer a wide variety of breads such as deli sourdough, whole wheat, jewish rye, squaw, 8-grain, onion rolls, dinner rolls and french rolls. The hearty breads that you can’t get at a supermarket. To help you plan for your next party, here is a check list for some of the items you might need. We'll be more than happy to help you provide them at a small cost. It’s as simple as ABCD. Just take a look at this menu and you’ll find out that we make it easy for you to pick and choose. Pick your favorite Platter(s) from (A) Hors D’oeuvres, (B) Salads, (C) Main Courses, (D) Desserts. And there you have it, a guaranteed success to your occasion. And if you have a special request, let us know and we’ll custom design your platter, or ask us about our customer favorites and our best sellers. So please feel free to consult with our Deli Managers for assistance. We would like to know the kind of party you are having and the number of guests so we can recommend what kind of varieties and quantities to guarantee the success of your occasion. Give us a couple of days notice, but you can always count on us to put something together for you at the last minute. Remember that we are here to make things easy for you and take the pressure away from your busy schedule. Delivery service, set up and catering are also provided at very reasonable cost. So next time you would like us to send a beautiful platter for someone’s birthday, just call us. We will design something special and deliver it, with a birthday card, a flower and a smile! We hope that we can assist you in your next party and that this menu can make things easier on you. We invite you to share in a fresh “Gourmet Experiance” at Golden Bagel Cafe.